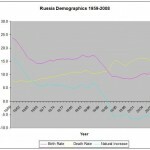 Russia’s demographic situation continued improving this year: according to the H1 2010 data released by Rosstat, relative to the same period last year, the number of births increased by 2.3% from 12.1‰ to 12.4‰ and deaths fell by 1.8% from 14.6‰ to 14.4‰. This means that once net migration is factored in, Russia is set to register its second consecutive year of positive population growth. This should come as no surprise to S/O readers, given that both my and Sergey Slobodyan‘s projections indicated this would be the case (but the same cannot be said of those who read Mark Steyn or Nicholas Eberstadt). 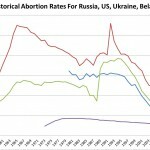 This means that Russia’s total fertility rate (TFR) is likely to rise to around 1.60 children per woman this year (2009 – 1.56, 2008 – 1.49), which is similar to Canada and Estonia. 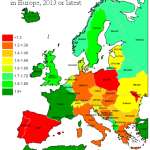 These trends can be compared with those in other E. European countries, e.g. Ukraine‘s 5% fall in births during Jan-May 2010, Belarus‘ stagnation in H1 2010 and Latvia‘s remarkable 21% decrease in births in H1 2010 relative to H1 2008 (the Baltic country’s TFR will now be around 1.15-1.20, the lowest in Europe). On the mortality side, Russia’s life expectancy will likely regain or slightly exceed its Soviet-era maximum of 70 years. 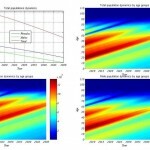 Guest writer Sergey Slobodyan summarizes these developments in the light of his September 2009 forecasts and February 2010 updates. Last month (June) was very interesting. Fertility was extremely strong (about 158 thousand births, 5.7% more babies than in June 2009; in turn, June 2009 was a whopping 13.3% more fertile than June 2008) but mortality dismal (just 0.1% less than in June 2009). The number of babies born daily in June 2010 has been among the highest on record since the early 1990’s. It beat both pessimistic and optimistic forecasts which were nicely bracketing actual fertility during the earlier months of 2009. Perhaps, the traditional summer births peak is shifting towards earlier months? For H1, total number of births is 2.3% higher than in 2009 H1. The fertility trajectory closely shadows my “pessimistic” forecast, made using the data through Dec 2009 (and thus incorporating all the crisis fertility postponement). Total number of births for H1 was given at 864 thousand, actual number is about 867, and the “optimistic”forecast gave 882.5 thousand (optimistic forecast does not use the crisis 2009 year’s data). Whether fertility remains in a somewhat suppressed state characteristic of 2009 or has returned to the buoyancy of pre-crisis years will be determined in the next 2-3 months. 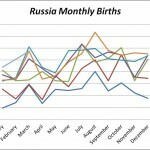 The optimistic forecast gives a very strong summer peak in July-September 2010, with fertility levels even higher than actually observed this June and pushing 170 thousand births per month. Pessimistic one sees a plateau at a much lower level of about 157 to 160 thousand. It is therefore rather hard to predict the final fertility of 2010; I currently expect 1810 to 1815 thousand births but won’t be surprised to see 1830 to 1840 thousand. Both forecasts predict natural population growth in July and August (and optimistic extends it to September). This forecast is somewhatendangered by the mortality that has been too high recently. For H1, it’s just 1.8% less than in 2009. June 2010 mortality is higher than even in pessimistic forecast; as with fertility, the two forecastswere nicely bracketing the actual development earlier in 2009. The July figures will be negatively affected by the heat wave, which increases both natural (heart diseases and old people in general) and unnatural deaths (drowning). Still, total deaths for 2010 are solidly on track for dropping below 2 million for the first time since 1998. I would expect 1975 thousand deaths, with a potential downward risk toward 1950 thousand, for the whole of 2010. In the worst case, natural population decline in 2010 will be 160-165 thousand. Given typical levels of migration increase registered inrecent years (around 250 thousand), there must be population growth in 2010, as was observed in 2009 but bigger. Reasons of death continue to paint a rather standard picture: slowly decreasing cardio-vascular deaths (2% less in 2010 H1), stagnating cancer deaths (0.7% less), quickly dropping respiratory (6.2% less) and deaths from external reasons (6.1%). Transport deaths, alcohol poisonings, murders, and suicides all declined by 10-15%, indicating a further drop in alcohol consumption and/or access during nights and holidays [AK: this means deaths from “vices” have finally dropped below 1990 levels]. Faster improvement in mortality will be impossible without material changes in cardiac care and lifestyle changes (including alcohol consumption). It remains to be seen whether alcohol is consumed in lesser quantities or just in less dangerous ways; in the first case, the cumulative effect will eventually exhibit itself in a more significant cardio-vascular deaths decline.